The deck construction experts at Chesley Fence & Deck have nearly 40 years of experience building custom outdoor living spaces for homeowners in Collinsville, Illinois. 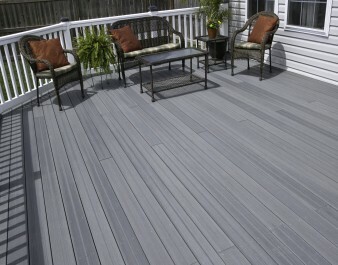 Over the years, we have earned an unrivaled reputation for providing top-of-the-lien decking products and installing them with the utmost precision. As a testament to our commitment to customer satisfaction, simply look to our long-standing A+ rating with the Better Business Bureau. No matter what type of decking you choose to have installed at your home, you can rest easy knowing that Chesley Fence & Deck is the best deck construction company for the job. Not only are our products among the finest available in the industry, but we only have highly experienced technicians install them, ensuring the project is completed correctly the first time. To learn more about what makes Chesley Fence & Deck the premier deck construction company serving Collinsville, IL, contact us today. I’m happy every time I look out my back windows and see my beautiful new fence!